Millennium Pizza? is licensed under a Creative Commons Attribution 3.0 Unported License. Permissions beyond the scope of this license may be available. Posted to Flickr on 23 May 2009. Part of the Stormtroopers series. 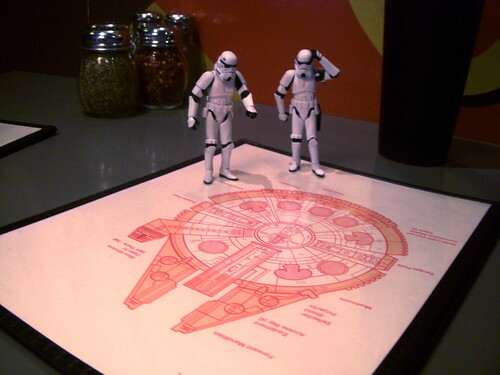 "Wait, do you think they were actually flying around in a giant pizza?" "If so, that whole ‘Pizza The Hutt’ gag in Spaceballs makes a lot more sense!’"
One of three stormtrooper photos taken today at Home Slice, the best pizza place in Austin, TX. This is one of the many cool illustrations they have on their menus. This photo was posted to Flickr on 23 May 2009. It was one of 500 images featured on Flickr Explore for that day. The last time I checked, it had 18,930 views on Flickr. Millennium Pizza? by JD Hancock is licensed under a Creative Commons Attribution 3.0 Unported License. Permissions beyond the scope of this license may be available.